I thought we'd go with a different sensation here - freezing cold! S found this giant ice block sitting on the kitchen counter after breakfast this morning. 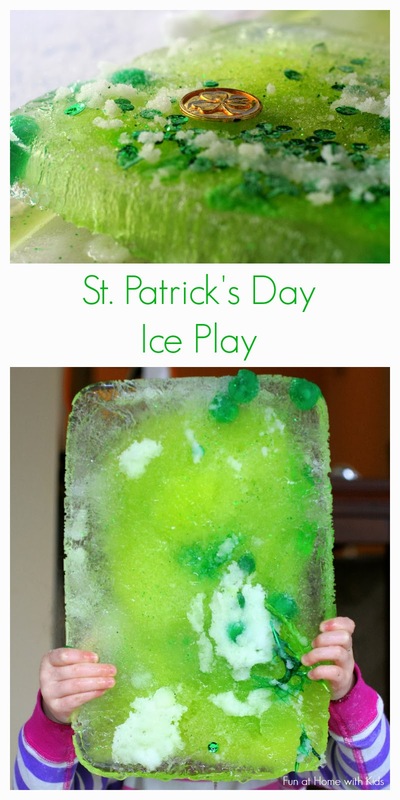 Green sequins, green pompoms, green glitter, green washable paint, green Colorations Liquid Watercolors, green feathers, and two gold coins were all encapsulated in the ice block. S could see the gold coins near the surface, just below a layer of ice. She tried picking them out with her fingers, but it didn't work. I asked her what people put on the sidewalks in winter to keep them from being icy (she needed a little hint - it starts with "s") - and she remembered salt! We talked about how adding salt would make the ice melt (I felt that that was about as much explanation as a 3.5 year old could handle - talking about it changing the melting point seemed like it would be a bit over her head). She excitedly began pouring and spreading salt. In particular, she added two big piles over the two gold coins. It was crazy to watch the salt making the ice bubble and we could hear it audibly crackling. After waiting a minute, she cleared the salt piles from the gold coins and used a spoon to pry the coins loose. Voila! Two more rescued coins! The ice block looks super cool! She's currently using it as a giant iceburg with, you guessed it, dinosaurs. She's also enjoying using piles of salt to create little "lakes" of icy water for the dinos to jump in, and as the ice melts, she's rescuing all the little feathers and sequins and pompoms that were embedded in the ice.